Pen-and-ink drawing of a tomb and mosque beside Dada Harir's well and a pillar in the Kochrab mosque at Ahmadabad by James Burgess (1832-1916) between 1884 and 1886. 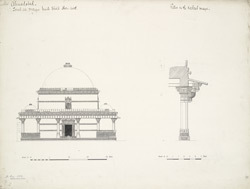 This image is from an album of 47 drawings of plans, sections, elevations, sculpture and architectural details from monuments and sites in Ahmadabad and its neighbourhood c.1884-1886. They were prepared mainly by Indian draftsmen under the supervision of James Burgess (1832-1916) of the Archaeological Survey of India. The city of Ahmadabad was founded in 1411 by Ahmad Shah, Sultan of Gujarat, on the site of the village of Asaval on the banks of the Sabarmati river. The step well of Dada Hari was constructed in 1499 to provide and cool resting place and drinking water for travellers and pilgrims. The step-well comprises a series of inverted tiered galleries placed at intervals along a staircase which reaches down to the base of the octagonal well-shaft. The step-well is accompanied by a mosque and the tomb of Dadi Harir herself. The mosque has windows with graceful ornamental perforated patterns and two carved minarets either side of the central arched entrance which were damaged in 1819. The tomb is square in plan with a high central dome supported on interior pillars and lintels arranged around the cenotaph of the deceased. The second element of the drawing shows a pillar from the mosque at Kochrab in the Ahmadabad district. It has a polygonal shaft, with ornately carved base and capital, and acts as a support for a horizontal lintel and roof above.